In brief: The food is excellent at Marlow & Sons, though the lunch menu is sparser than the dinner I remember from years back. The downsides are small and expensive portions. 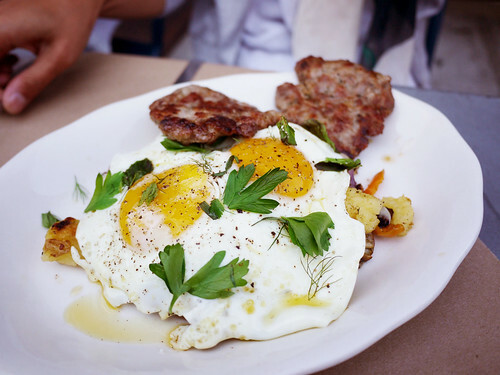 The two ladies next to us were much more annoyed with their small portions than we were, but that's because we added a side of sausage to compliment the fennel salad and sunny side up eggs over potatoes. We threw down a twenty each and I felt slightly annoyed that such a light lunch was so much, though as M. points out, it was rather good.